February, 2004 -- August, 2011. 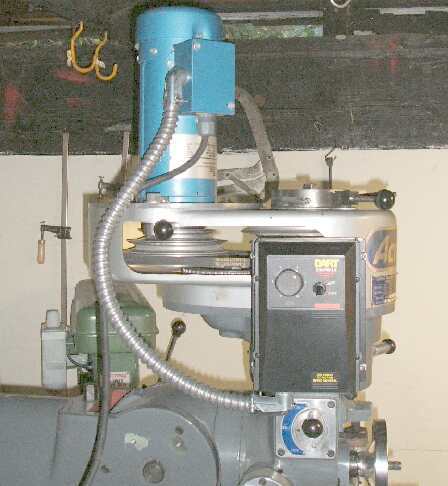 The primary power in a vertical milling machine is an electric motor driving the spindle. 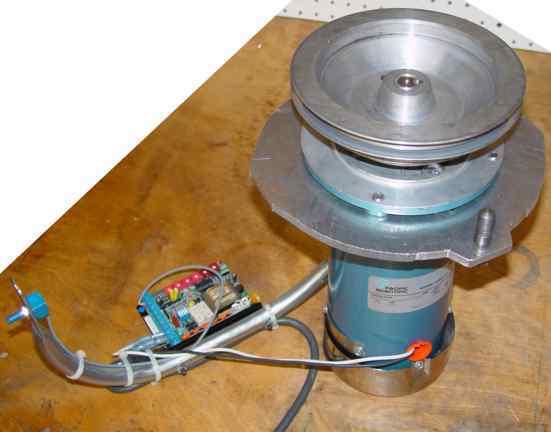 In this project, I replaced the original 1-HP 3-phase 230 VAC electric spindle motor on a Bridgeport machine with a 3/4-HP DC drive motor. By adapting surplus, high-quality components, I was able to implement the superior characteristics of DC drive for less than the cost of the usual VFD retrofit. Source power is 120 VAC single-phase house current instead of industrial 3-phase service. Infinite variable-speed control of the motor. Full torque at lowest speeds without changing step-pulley belts. DC motor characteristics are better matched to task loads compared to AC motors. Of vital importance to the small shop is that machines run off single-phase electric power. Larger machine tools are almost always originally equipped with 3-phase AC motors. When running such machines in a shop with only single-phase supply, the usual adaptation is to install a "phase converter" or electronic variable-frequency drive (VFD), neither of which is entirely satisfactory, and both of which involve some expense and require some space. Phase converters are both inefficient in the use of the electric power, and reduce the shaft power available from the motor. VFD's are more modern devices designed as electronic charge pumps; most can run off single-phase input power, with some inefficiency and derating of the maximum converted power rating, although the motor can be fully supplied if an over-rated VFD is employed. A VFD also provides a limited range of speed control; the more sophisticated implementations offer programmable acceleration and torque settings, and even computer interface and control. While the expense of these converters is in the multiple $100s, they are cheaper than retrofitting a DC motor and drive, so they are typically the practical solution. Torque and speed are controllable independently and over the entire range from zero to maximum ratings (torque proportional to current supplied, speed proportional to voltage). This is well-matched to milling applications, where various speeds-and-feeds requirements reflect back to the prime mover as motor speed and torque requirements. Peak and short-term delivered power can be multiples of the continuous rating. This is also well-matched to milling applications, where periods of heavy cutting intersperse with lighter cuts. While a DC motor has a continuous horsepower rating, it can deliver and sustain multiples of that horsepower, subject to heat dissipation and mechanical limits. 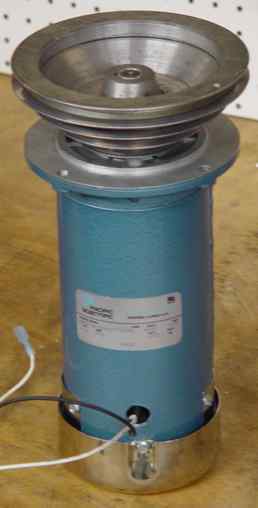 A 3/4 HP DC motor can replace a stock AC motor rated from 1 to 2 HP. The DC motor control converts the AC input power to a variable voltage and current-limited DC supply, typically through a chopped MOSFET charge-pump and rectifier design. The DC controller may also have settings for acceleration and deceleration rate, maximum torque, maximum voltage, and jumpers for AC input voltage (120 vs 240 VAC). For all their advantages, DC motors are not used much because both motors and controls are expensive, and the brushed designs require periodic maintenance for brush inspection and replacement. But it is primarly the cost of DC motors and drives preventing their use in machine tools. However, in my experiments with DC motors for servo control, I acquired a number of permanent magnet DC (PMDC) motors and controllers at very low cost. 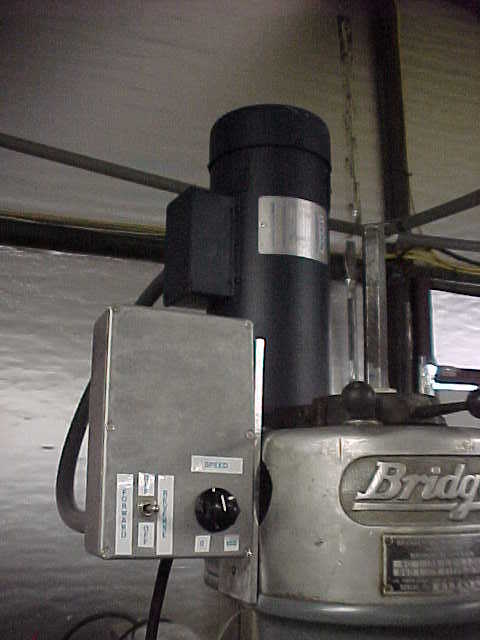 This photo shows the finished project, with the blue motor and blue adapter plate installed on the Bridgeport milling machine. 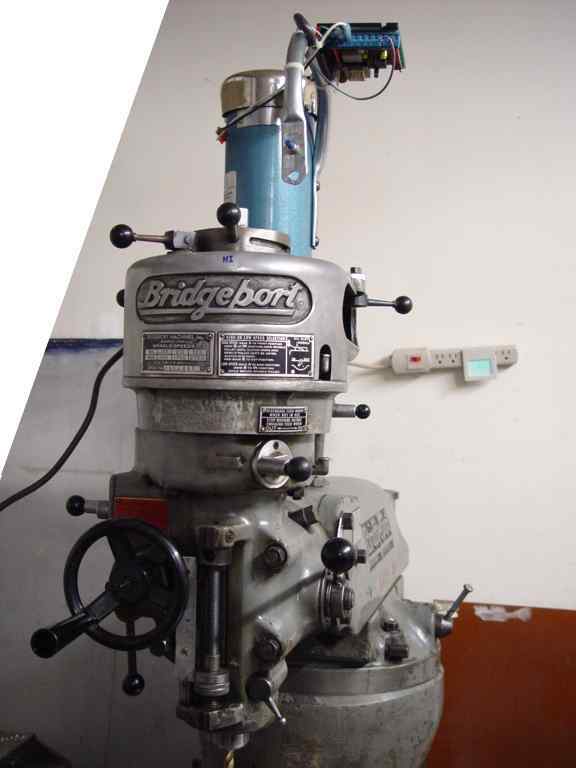 The 1970s-vintage machine is equipped with a Bridgeport J-head, which originally had a 1-HP 3-phase "pancake" motor installed where the DC motor is now installed. To mount the DC drive controller and power connections, I bent and flattened some 1/2" thin-wall electrical conduit (EMT) using a conduit bender and arbor press, and attached it to the motor where the baseplate would attached with 5/16" screws. The flattened end of the conduit at the front of the J-head holds the potentiometer which controls the motor speed. The empty hole just below will hold a manual on-off switch (for now I just use a socket strip) connected to the controller's low-voltage start-stop signal; the planned CNC conversion will control the motor directly. This is all up on top of the machine, over 6 feet high, where it is out of the way of chips and materials. Let's go through the steps involved in this project. 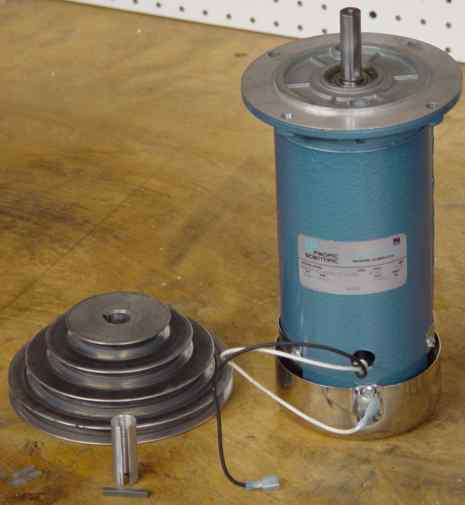 The motor I had available is shown here, a Pacific Scientific 3/4 HP PMDC motor, model SRF3736-4243-7-56HC (mechanical drawing, 42 KB PDF file). 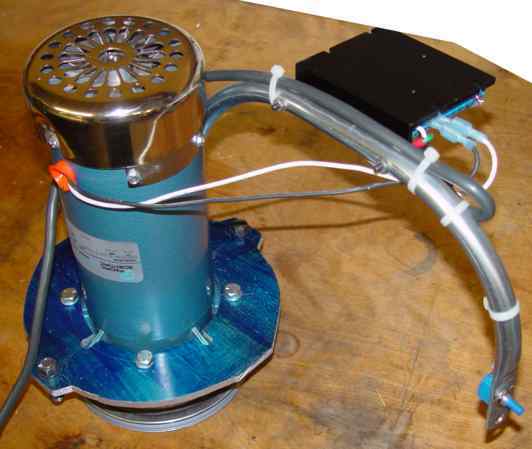 This is a NEMA-standard 56C motor, with a washdown housing (total-enclosed fan-cooled, or TEFC, and able to sustain wet environments), but minus the connection box and baseplate. The NEMA C-flange series of dimensions is the most common type of motor face mount. NEMA 56C size indicates a "C-flange" (also known as "C-face") mounting, that is, a face mounting plate with threaded bolt holes on a bolt circle around the shaft, in this case, 3/8-16 bolts every 90 degrees around a 5.875" circle, with a 5/8" diameter shaft projecting 2" from the shaft. While this motor runs about $500 new, I found this new one for less than $50 on eBay. Also shown are the original cone pulley from the Bridgeport machine, and a bushing and key to adapt the motor shaft size to the pulley. The controller (seen mounted on the conduit tube in the first photo) is a single circuit board about 6-inches square and 1-inch high, with its own aluminum heat sink. Controllers like this are typically about $300. This one happens to be an Electrol model 790, likewise an eBay purchase for $75. 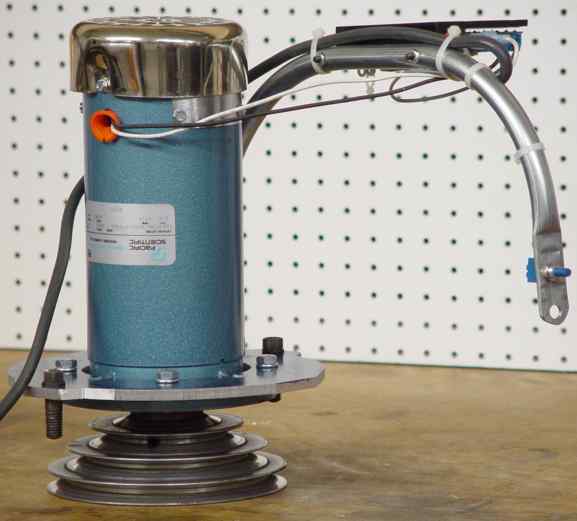 It can be jumpered for 120 or 240 VAC input, and configured with switches and potentiometers for acceleration, deceleration, min/max speeds, torque limit, IR feedback compensation, and 90 vs 180 VDC motors. DC motors and controllers are standard industrial items widely available from suppliers like Grainger. There are cheaper controls available that provide only speed regulation that would be suitable. If you were shopping for appropriate items, you would want to consider an appropriate horsepower, and find a compatible (or at least adaptable) shaft size and mounting configuration, such as the NEMA 56C size shown here. 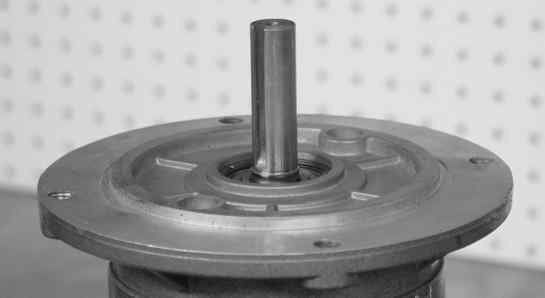 The original motor provided a 3/4" shaft with 3/16" keyway, on which was mounted a specific cone pulley (step pulley). The new DC motor provides a 5/8" shaft and the same keyway. Rather than try to find this same pulley with the smaller 5/8" shaft size, I machined a bushing to allow the original pulley to fit the new motor shaft. This bushing is simply 3/4" (+0) outside diameter and 5/8" (+0.002") inside diameter, turned on the lathe from 6061 aluminum. The length is 2" to cover the entire shaft length of the new motor. I cut the 3/16" keyway on the mill-drill using side-milling on a 3/16" end mill. 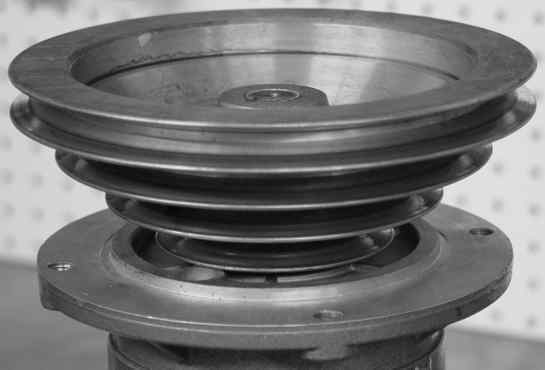 Similar "cone" or "stepped" pulleys (sometimes called "sheaves") are typically available in stepped nominal OD sizes of 3, 4, 5, and 6 inches, pitch diameters are 2.7, 3.7, 4.7, and 5.7 respectively, which match the Bridgeport machine. IDs such as 5/8" or 3/4" will fit the motor shaft. You might search mcmaster.com or eBay to find these items for sale. MSC used to sell a similar cone pulley in various shaft bore sizes which apparently has been discontinued, part numbers 00053843 in 5/8" ID or 00053850 in 3/4" ID. Here is the shaft end of the new motor in three views. First, the bare shaft. Same motor shaft, with the bushing installed. Same motor again, with the bushing and cone pulley installed. This is the completed motor assembly before mounting. Here is the drawing. Select the thumbnail at left to bring up the detailed PDF version. The original Bridgeport "pancake" motors use a short, fat design that mounts directly to the large opening in the J-head aluminum casement. The new motor is relatively tall and skinny, and therefore requires a custom mounting plate to adapt the face to the opening in the J-head, and to align the drive pulley to the driven pulley. By making a lot of measurements and sketches, I came up with this design [drawing, 118 KB PDF file] for the adapter plate. See also the 3D model [21 KB DWF file, requires the free Autodesk DWF Viewer]. This started as a rough hand sketch [drawing, 22 KB PDF file]. The plate is cut from 5/16" thick aluminum sheet, on which I painted blue layout dye and scored layout axes and positions using a carbide scribe, ruler, caliper points, and a compass. The mounting of this plate, and therefore the center cutout, are rather unusual, because the axial alignment required that the rear of the motor faceplate (instead of the front as usual) attach to the adapter plate. 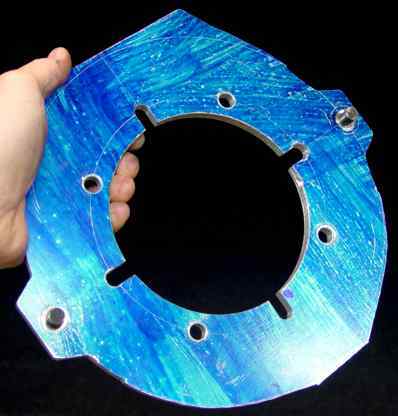 The center cutout is therefore sized to pass the body of the motor, with notches for clearance to the gussets reinforcing the motor faceplate, and 4 holes for the 5.875" diameter bolt circle attachment of the motor. The two "ears" at the edge of the adapter (shown with the original 1/2" hold-down bolts from the old motor) attach the motor to the J-head. To make this complex cutout, I wrote G-code by hand for the CNC mill-drill machine, which cut and drilled the pattern using 1/4" and 3/8" end mills. I checked the G-code by dry-running the paths on the machine, and watching that the tool path followed the manual scribe marks. Hand-written G-code for a shape like this involves some tricky trigonometry, and I had to make quite a few corrections to the code before it was correct and ready to commit to metal. Aside from the ears, the outside edge is only roughly cut on the band saw, since the mill-drill travel was insufficient to reach the edges of the nearly 11 inches of diameter. I could have done a neater job of CNC cutting the curves by re-clamping and re-registering the work, but this was not worth the effort for a non-functional aspect of a one-off part. You may notice that the adapter plate mounts oddly onto the motor, being bolted to the back side of the face flange, instead of normally on the front. 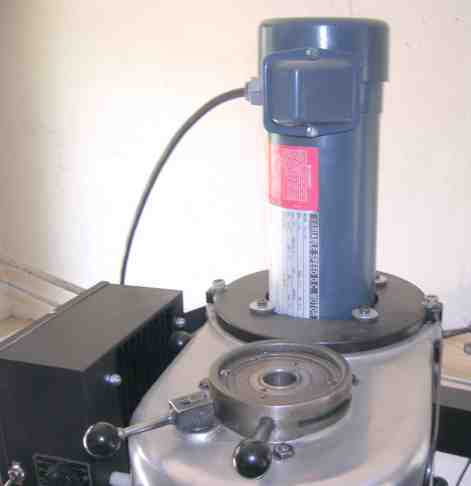 This was necessary to get the proper axial alignment of the motor to the machine casement, such that the drive pulley lines up with the driven pulley. This modified mounting successfully fit the random motor I happened to have to the machine. A motor in a different power size might have had the proper alignment and shaft size, or might have required a different adaptation. This is something to plan carefully for when shopping for a motor. Here are some photos showing the completed assembly before mounting on the machine. This is the view from the operator's normal position of the installed drive. I never bothered with a proper enclosure for the control board, speed dial, and on-off switch, and being up and out of the way the open construction has not been a problem. I did later add an on-off switch below the speed control potentiometer, so I can switch the motor on, or off while engaging the spindle brake lever, conveniently. The drive is a joy to operate, with the tiny dial giving complete control of the motor speed from 0 to 1750 rpm. For routine work, I keep the pulley on the third-highest step, disengage the backgear, and use the speed control dial to set the proper speed for the application. By varying the step-pulley and backgear combinations, I can further vary speed and torque with gear ratios in various steps from about 1.6 down to 0.046. Since the motor develops about 3 ft-lb continuous torque (and a potential for some multiples of that), the spindle can be geared down to a few rpm at over 65 ft-lbs, which translates to several tons of force on the edge of a 1/2" cutter. Try that with your VFD! Looked at the speed ratios another way, the stock motor specifies 1730 rpm at 60 Hz 3-phase power. 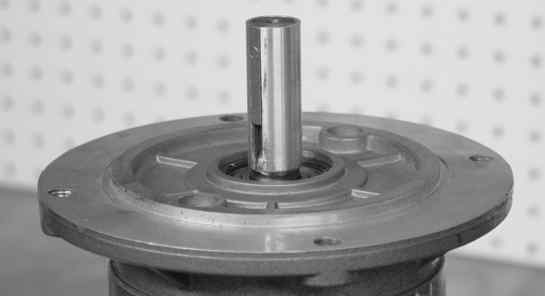 The spindle speed table stamped on the head of the Bridgeport machine says the spindle speeds for the four pulley steps are 660, 1115, 1750, and 2720 rpm. These are ratios of 0.382, 0.645, 1.01, and 1.57 from the nominal 1730 rpm motor. Since I am using the 3rd step for general work, this is more or less a 1:1 ratio of spindle to motor. The ratios given by Bridgeport must include some significant belt slippage, since the pulleys are of obviously different diameter. Bob McKee kindly sent me photos of his DC drive retrofit. Bob used a new 3/4 HP Electrol motor he found on eBay. 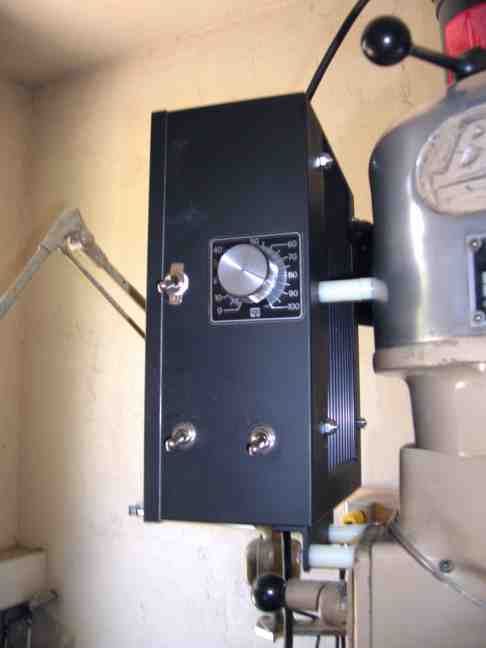 He used a KBCC-R controller and fabricated a box to house it, mounted on the left of the mill, replacing the original forward-off-reverse switch for the original 3-phase motor. Bob reports that he "wanted the reverse to perform dead spindle tapping; it works great. The switches on the motor control box are: Top Left, Power on and off. Lower Left, Machine on and off. Lower Right, Forward/Brake/Reverse. Upper Right, Speed Control." A fellow named Joe sent me this photo of his DC drive retrofit. He used a 1 HP Pacific Scientific motor (new) and a Dart DC controller (new) from eBay for a grand total of $110. 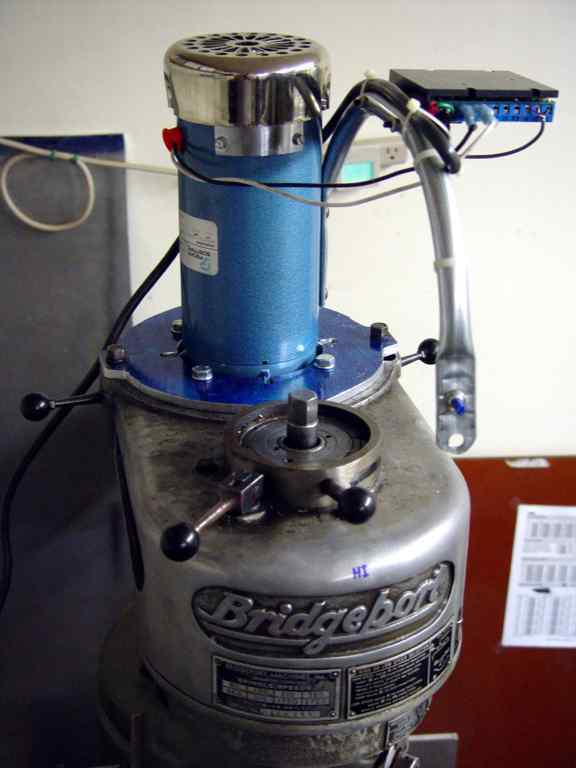 His mill is an Acra make, which is an imported Bridgeport copy, and which uses the step-pulley drive. John Horton wrote to say, "I made the plate from your drawing, The motor is a 1.25 HP 180 volt from surpluscenter.com [part number 10-2213]. Controller is a Beel industries unit. Works great. It will not stall even on the heaviest cuts." Suitable controllers available from surpluscenter.com look to be the open-frame Minarik MM23001C (surpluscenter.com part number 11-2269) or the encased and assembled (part number 11-2102). Have a comment or question about my Bridgeport DC drive?